Sonar pings #72 – We’ll be fine. Seriously. It took no more than the 90 minutes against Goiás for the Palmeiras supporter to breathe a little easier, the rather convincing 2-0 victory showing that the squad has potential after all. Our players corresponded to God-knows-what, as often the case when a coach is sacked, and aggressively occupied every centimetre of the pitch. Lúcio braced his first in the Palmeiras jersey, recently arrived forward Henrique scored his third goal in as many games (Alan Kardec who? ), and home-grown Chico made his debut in the first team. An important night and an important result, no doubt. Highlights below. Palmeiras are approaching several coaches, looking for a replacement for Kleina, but there are frankly speaking not that many options available. Ney Franco was one of them but he today resigned from Vitória to go to Flamengo. Jorginho, Dorival, Caio Júnior… The name of choice will most likely be Vanderley Luxemburgo, providing he accepts the lower salary (US$ 90K, same as Kleina) and the productivity model. Mind you he just might: Luxa’s been out of business since late 2013 and probably see this as an opportunity to redeem himself from last years’ fiascos. In any case, expectations are high for a disclosure within days. 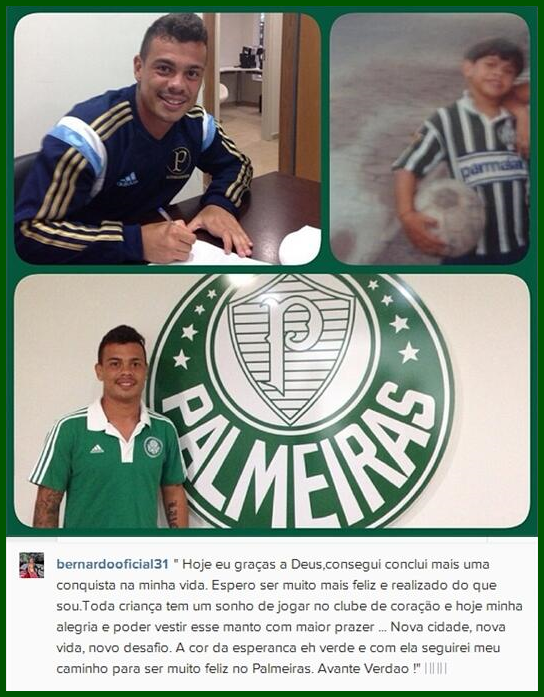 Yesterday, offensive midfielder Bernardo signed a contract with Palmeiras until the end of the year. A bit of a problem child in regard to his private life and unable to maitain regularity at Vasco da Gama, he’s been given a second chance at Palmeiras. It’s obviously a risky move, but could pay off hugely if he grabs the opportunity. Who knows some fresh (?) air in a new city does wonders for Bernardo; that and the fact that he’s now both player and supporter, as the instagram picture he published yesterday indicates. Bernardo reinforcing the midfield, why is that a priority? There’s Valdivia, Bruno César, Mendieta… Well, anything can happen during and after the World Cup and there’s a real possibility that our Chilean opts for continuing his career in Europe. Valdivia has a new manager in Wagner Ribeiro, the same as Neymar. And Palmeiras president Nobre makes no secret of the fact he considers Valdivia’s salary – some US$ 200K a month – too high. Valdivia is already in Chile with the National squad. We might, actually, have seen the last of him in the Palmeiras jersey last Saturday against Goiás. Not only Valdivia is destined for the World Cup: defensive midfielder Eguren today made Uruguay’s list of 25 (two will be cut before the final announcement). Good luck to him as well. During the next two months he can contemplate why he’s in the National Squad while simultaneously at Palmeiras warming the bench for Josimar. Or at least was: Kleina’s exit must certainly change a thing or two. 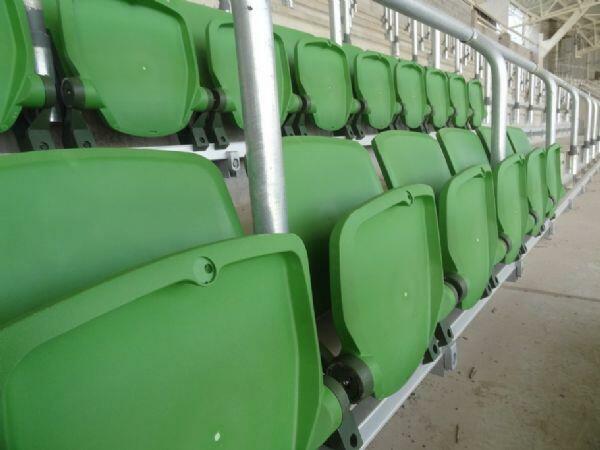 At the Allianz Parque, a first batch of chairs have been mounted on the metallic rails, Wembley-style. By not bolting the chairs to the ground, more space is freed up and it’s easier to clean the floor. On the picture you see a simple version: other sectors while have chairs with arm rests, some will have stuffed seats. All chairs will be fire proof. 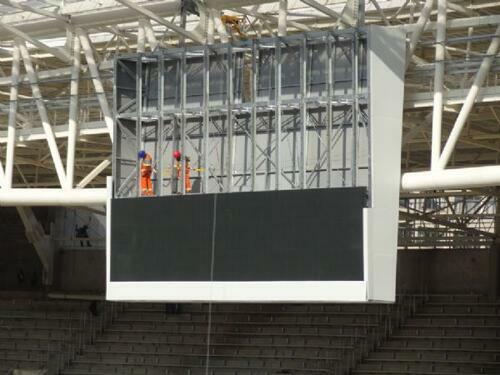 The LED screens are also coming up… Look at the size of that thing! Next week I’ll be bringing you some first-hand information in regard to the progress of installations at the Allianz Parque. Fingers crossed against Sampaio Corrêa on Wednesday: Palmeiras need a victory to advance to the next round in the Brazil Cup, advancing being nothing short of an obligation.